She couldn't yet walk but from the moment of her birth, Ruth Mackenzie Apgar (a.k.a. "Ruthie") was already following in her mother's footsteps. You see, her mother, Lauren, was born at Holy Name Medical Center. Now 34 years later, Lauren gave birth to Ruthie at Holy Name, who also arrived late, but perfect. At her birth, Lauren weighed in at a healthy 11 bs. 8 oz. and was 23.5 inches long, one of the largest babies to be born at Holy Name. Before Ruthie's debut, family and friends were wondering if it was going to be a case of "like mother, like daughter?" Not only was Lauren a big baby, she was also two weeks late. "It's no wonder I'm an only child," she joked. Just like her mom, Ruthie seemed pretty comfy and cozy where she was, having Lauren and her OB/GYN convinced this baby had no intention of showing up on her due date either. 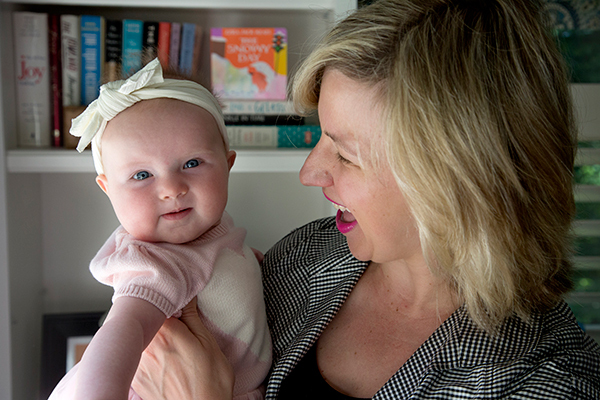 "At that point, Ruthie was generously proportioned at just over eight pounds so my doctor decided to induce me because letting it go any longer could be cause for trouble," Lauren explained. So, more than three decades after she was there, mom-to-be packed a bag and headed back to The BirthPlace at Holy Name. Though she obviously didn't remember it from her first visit, she still felt right at home. "My grandfather was on the Board at Holy Name and when I was in college I volunteered at Holy Name, working in the Gift Shop," she said. At 9:04 p.m. on December 19, 2017, Ruthie entered the world, weighing in at 8 lbs. 13 oz., and 20.5 inches. She didn't break any records, but she certainly held her own and her parents couldn't have been any prouder. "She was absolutely perfect," said Lauren. Still, Ruthie had a reputation to uphold. Her mother scored a perfect ten on the APGAR score, which is used to measure things like the baby's color, heart rate, reflexes, muscle tone and respiratory effort. And no, it's not a coincidence that Ruthie has the same last name as the test. "My husband, Greg, has a distant relative who came up with it," explained Lauren. That relative was Virginia Apgar, an obstetric anesthesiologist who developed the measurement in 1952. It is now used on every newborn today, including Ruthie, and who, just like her mom, aced the test. "Grace under pressure," jokes Lauren. Five months later, mother and daughter continue to thrive. Lauren says Ruthie is a voracious eater, a good sleeper, and an observant, smart little cookie. Sesame Street and Pinkalicious are already favorite programs and Pat the Bunny tops her book list when it comes to story time. Since Lauren had not been in a hospital since her own birth, she didn't really know what to expect. But she couldn't have been have been happier with her experience at Holy Name. "The doctors and nurses were all so warm, caring and responsive and I took comfort in the strong sense of faith and community Holy Name fosters," she says. Lauren hopes the mother-daughter trend will continue and Ruthie will give birth at Holy Name, carrying on the family tradition.